Decorative concrete, concrete countertops, outdoor living spaces, and horse pools. Looking forward to another year with our clients in the concrete world. Spring Has finally shown itself and we are ready to dive in! 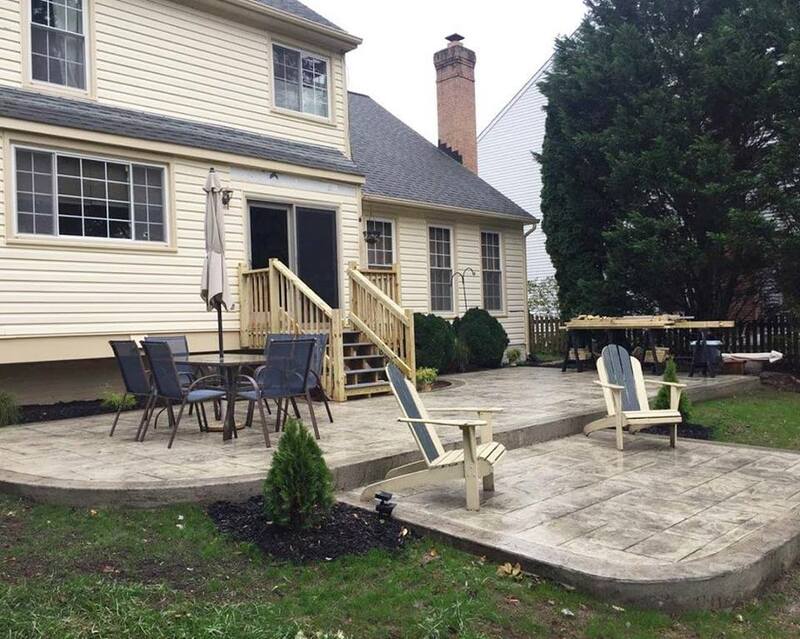 From large structural slabs, elevated decks, gigantic stamped concrete projects, to a simple patio. Let us help in the design and planning stage. Excited to get our 12th year underway stamping concrete. It’s been a very busy winter doing commercial flat work, now it’s time to do what we love; making concrete beautiful! It’s 4th of July Week and we are taking some time to sit back and enjoy the activities and have a fun #contest! 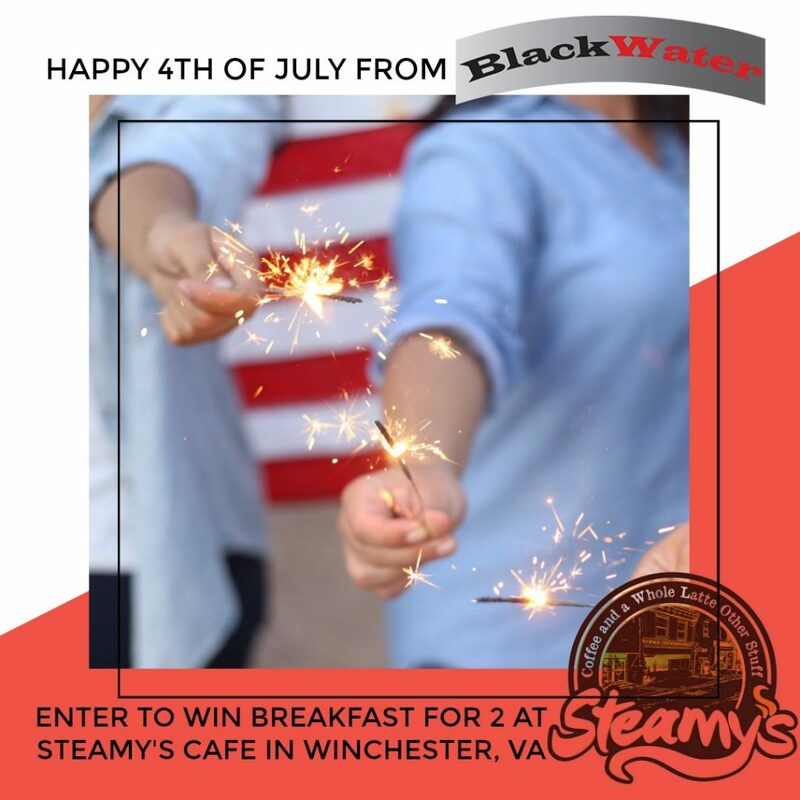 How would you like to win breakfast for 2 at Steamys in Winchester? Hop on over to our Facebook Page to enter for your chance to #win! 1. Share a picture in the comments of you enjoying your #patio – from friendly gatherings to outdoor relaxing! 2. Like and share the post to be entered to win. Winner will be picked on the 9th! Strategy and planning out your concrete needs is a key part of the proper execution. Without the proper planning, your project could turn into a failed mess. We work with you from start to finish. First, we’ll walk through your location and discuss your ideas from design to use. We’ll give you our professional opinion on what will work and what may need to be redesigned. Together, we’ll agree to a well thought out plan and design that will meet your highest expectations. Before getting started we’ll assess the land and surroundings to determine the groundwork needed to prep the site. We’ll determine what obstacles we need to consider and what materials need to be used to deliver optimal results. As we establish a solid starting point we’ll build out the framework with all details in mind. We work hand in hand with you every step of the way to ensure each milestone is completed to your approval. Every little detail plays a crucial role, one missed item can be detrimental to the outcome as well as the longevity of concrete surface. You can see these steps in the pictures below. We understood the plan and execution needs. From the ground up, we built the concrete structure based on the needs and elements the client wanted. 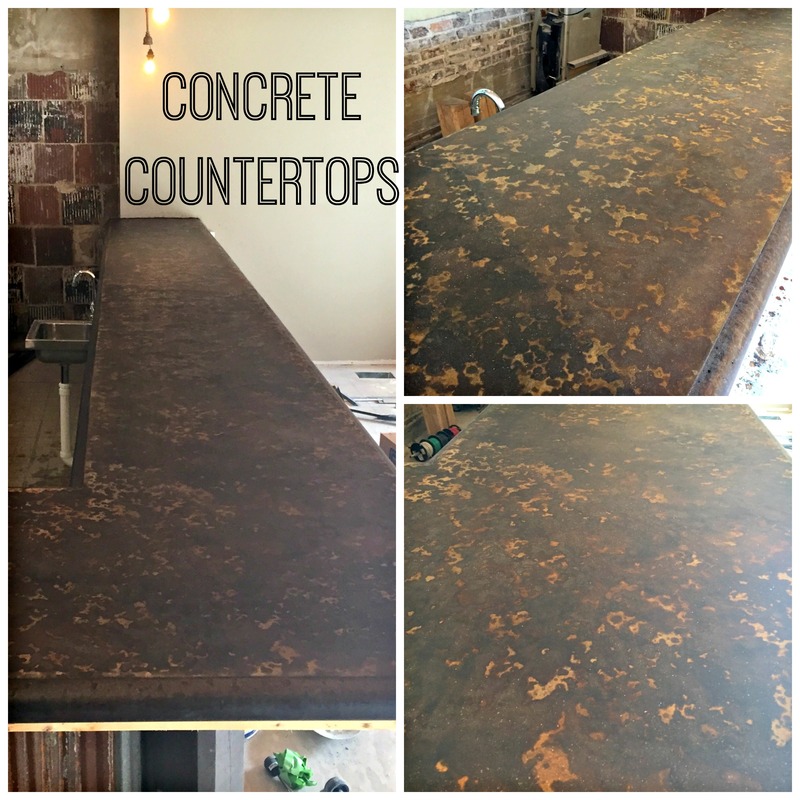 Why use concrete countertops? Well, because they are functional and…they just look cool! There are multiple reasons that make concrete a great material for countertops. Like any of the countertop surface options you’ll have your pros and cons but it comes down to your needs and desired look. Using concrete has many benefits, let’s cover some. You can create custom colors and designs by staining the concrete surface. Make it your own, match your color scheme, glossy or matte, the options are endless! When sealed properly it’s water and stain resistant. You can create a mold for nearly any shape you can think of. You can inlay objects like rocks, shells, sea glass, figurines, coins, etc. You can stamp it with a design. Concrete is heat resistant, but it’s still recommended to use caution when placing high heat directly on the surface. Contact us to talk about your countertop needs and how we can help. If you have a finished top deck area for your home, don’t limit yourself to one area of entertainment. Create two levels for outdoor entertaining by utilizing the space under your elevated deck or patio. We can work around obstacles and create a seamless integration, all while making the most of the space you have! Allow your creativity to run wild and design a multi-functional space giving yourself options for many uses. Create a welcoming space, provide a functioning entryway, open up your outdoor space. Whatever the need may be, our concrete patios are not only built to last, they are visually appealing too. Don’t settle, call us today! If you are considering a concrete patio and find yourself just staring at your space wondering what size patio do I need? What size should I use for the needs I’m looking for? Then it’s time to give us a call so we can go through all your options and possibilities! We did find a useful visual in the infographic below. They provided a nice display of the typical uses and amenities people have in mind when building their custom patio. How big of an entertainment area do you need? Do you plan on adding a fire pit or hot tub? There’s a lot to keep in mind while designing your space. Make a check list of must haves, would like to haves and plans for the future. This will help ensure you are designing a space that accommodates what you currently need with what you hope to do down the road. You don’t want to put time and effort into a custom design to find you are limited to the use you can get out of it just because of poor planning. Take your time, work with an expert and properly plan out the design that best fits your space and needs. Once you do, the possibilities are endless and you’ll have a patio that will last through years. 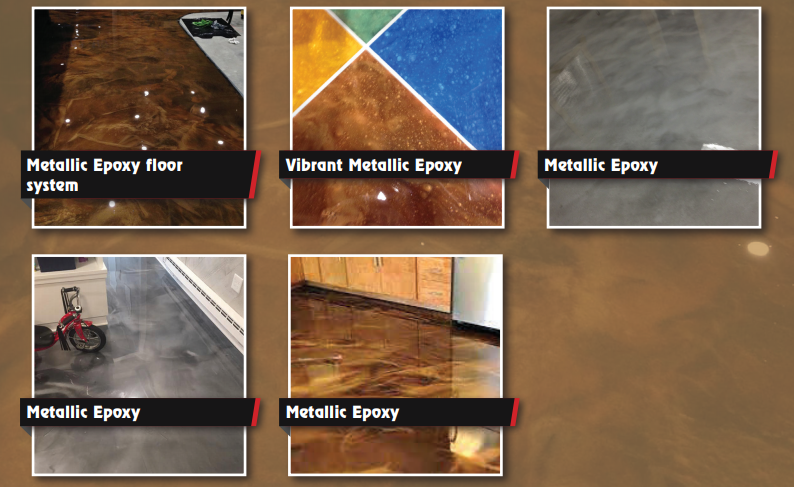 Create a custom durable, elegant floor with a high end look using epoxy floor systems. 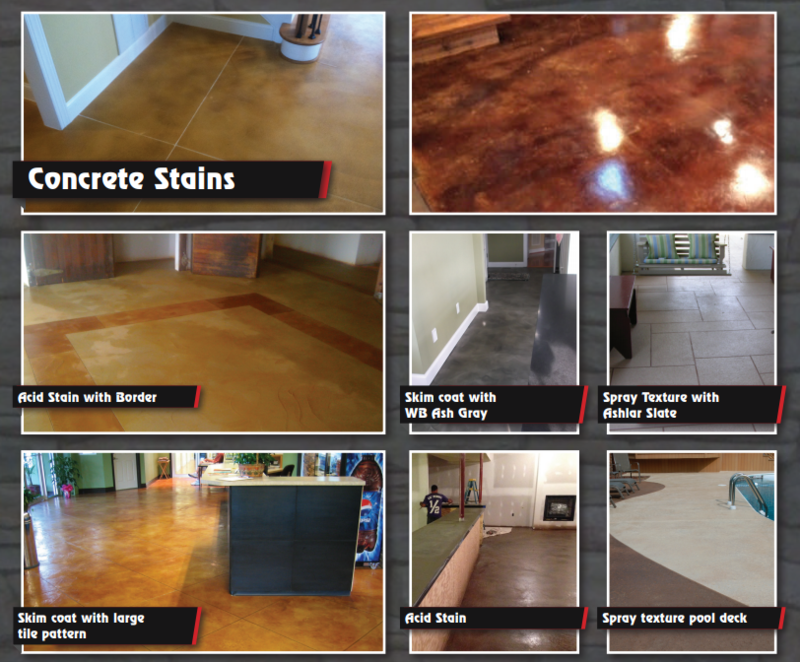 Perfect for Commercial and Residential, from offices to restaurants, basements to garages, epoxy is a great solution to consider for your concrete surface. Easy maintenance, durable, shock resistant, and great abrasion resistance. Concrete overlays and stains are a great facelift for your concrete surface. Good for both interior and exterior and low maintenance. Anti-slip finishes, oil resistant, salt resistant, durable and cost effective, this might be the option for you! Contact us, we’ll come out for a free assessment of your existing surface and talk about the best path for you. Limitless options, we can help with any surface. Stains, skim coats, spray texture….whatever your need, indoor/outdoor, Commercial Application, Restaurants, Basements, Garages, Carports and so much more we can provide the solution. Fall has blown in and winter is quickly approaching. It’s important to maintain the upkeep on your concrete surface to ensure longevity. Give your concrete surface a good cleaning. Clear off all the summer grim. Get our the pressure washer and with a mild cleaner rinse off any dirt. The leaves are beautiful but can create issues if not tending to. Wet leaves can leave stains or marks on your concrete surface if they are left over time. As soon as the leaves start falling, keep your concrete surface clear of any debris. As the days and nights get colder we need to prep for the ice to follow. Be cautious with the solutions you use on your concrete surface. Concrete can be weakened when subjected to rock salt. While concrete is a tough and durable material, it can and will absorb water. When you put out rock salt to melt snow and ice, the salt dissolves the snow and makes a salt water mix that then enters the pores of your concrete.When the temperatures drop and the water freezes, the pressure of growing ice crystals within the concrete can cause spalling (the surface becomes rough and flaky, and begins to pit). On a low level, this can be purely cosmetic, but it can also result in structural damage. Consider using sand instead. Give us a call or schedule a follow up to see how your concrete surface is hold up and discuss the proper maintenance options. Designer concrete that looks like wood, yes please! We’ve been creating more of this popular look for our clients. It’s a win, win situation! 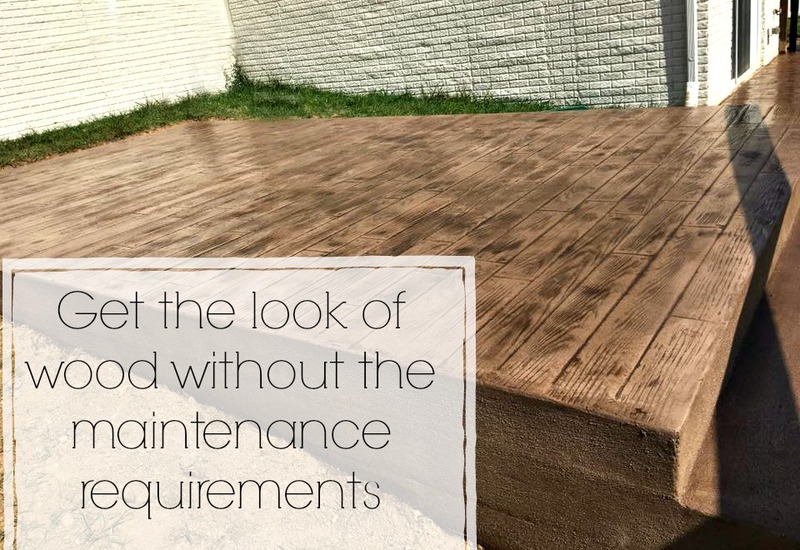 You can get the warm tones, look and feel that you want from a wooden patio but without the stress of regular maintenance, upkeep and eventual replacement that comes with a standard wood platform. Yes, they do have other options out there like, composite decking. But, it can get very costly and it’s not always accommodating for the land and area you have to work with. Concrete is built to last. With proper can and minimal upkeep you can design a patio, walkway, driveway, or outdoor living space that is completely custom to your wants and needs. You can work within a budget and still get the desired outcome. Check out the simple maintenance tips for stamped concrete here. Discover your options, meet with us to see if a concrete surface is right for you, you won’t be sorry! 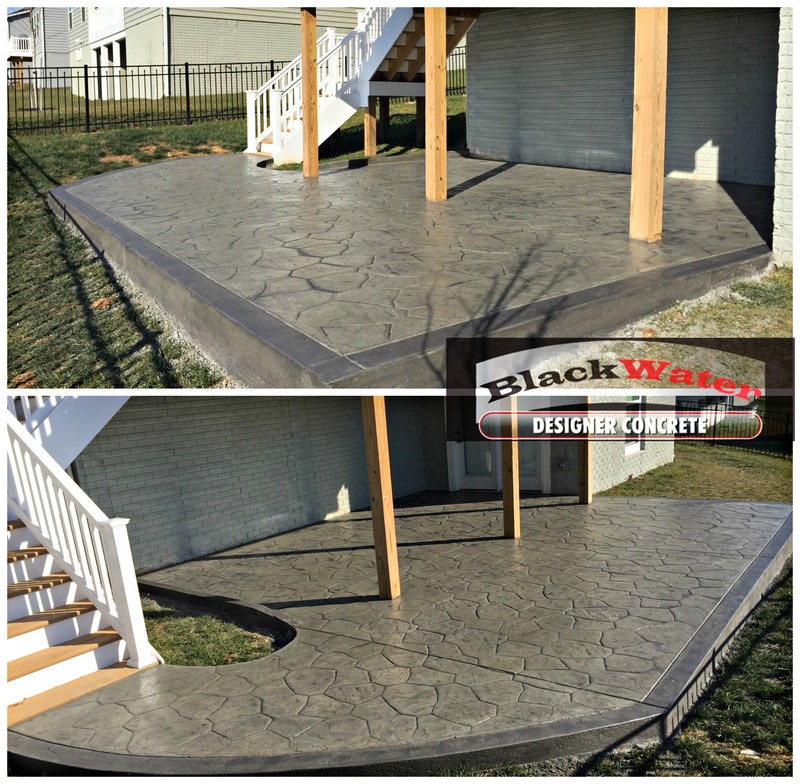 Check out more stamped concrete surfaces here. Check out our FAQ or drop us a line.